Everything was great, the staff was very friendly and the view from the room was amazing! Everything!! The view the staff the room the spacious and the layout of the rooms the decoration- fell in love with the place! Great view, cozy room, well equipped. Staff is very friendly and willing to help, location and food are also very good. Fantastic position. Great views. Rooms surround a restaurant that is run separately. The restaurant staff are fantastic. The food is brilliant. The rooms are new and well kitted out but very very small. The bathroom is an impossibility. The Kea Village staff are unfriendly and seem to have some very odd practices. The want you to have breakfast in your rooms. I refused. Stylish rooms and well situated facilities right above Ioulida village. Excellent staff, always available and helpful. Room-served breakfast! The unusually helpful staff, the beauty of the hotel's view and the fact that it was on top of the island's main town and near the crossroad that leads to all main directions of the island. Nice modern design of the suite and of the property overall. Outstanding attention to detail in regards to design but also to friendliness and professionalism of staff. The pool was really nice and we totally lucked out having a pool just outside our suite. Breakfast was included and it was perfect. The restaurant was great, delicious food, and the view from the restaurant was amazing. Lock in a great price for Kea Village – rated 9.2 by recent guests! One of our top picks in Ioulis.Located at the top of Ioulida, Kea Village offer a unique view of Kea’s main town and the Aegean Sea. 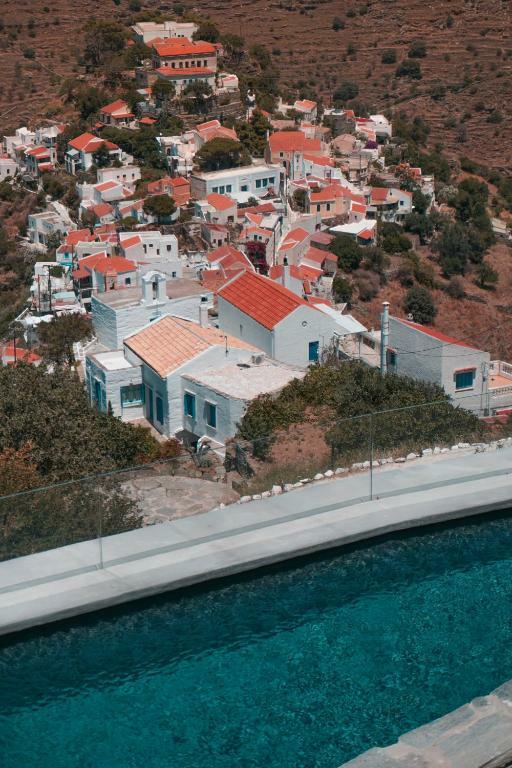 Built according to the Cycladic architectural style, the complex features self-contained private houses that share a swimming pool. The elegant villas are naturally aired, and feature ceiling fans. Both the living room and bedroom open onto large furnished verandas with Aegean Sea views. Wi-Fi is free, and villas come with an LCD TV and hi-fi system. Kea Village include a modern fully equipped kitchen with built-in electrical appliances and all necessary equipment for at-home cooking. Local wine, traditional treats and bottled water await guests upon arrival. 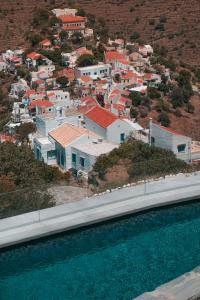 A 15-minute drive from the beach, Kea Village is 3.4 mi from the port of Korissia. The island of Kea is easily reached from Athens, approximately a 1-hour ferry ride from Lavrio port. Enjoy room-serviced traditional breakfast at the comfort of your suite. Parking on the premises is free. After a few minutes’ walk through the cobblestone pavements, you can reach the village square where you can visit the Archaeological Museum, the local market and taste local delicacies. This property also has one of the top-rated locations in Ioulis! Guests are happier about it compared to other properties in the area. When would you like to stay at Kea Village? This suite consists of 2 levels. On the ground level, there is a living area with TV, a fully fitted kitchen and a spacious terrace with views over the Aegean Sea. On the upper level, there are 2 bedrooms, a bathroom, storage area, while it offers access to a small garden with terrace. Entering the Honeymoon Suite, you will find the ample living area with a flat-screen TV, a fully fitted kitchen, a spacious bedroom and a bathroom. The spacious terrace offers view of the sunset and the deep blue Aegean Sea. Elegantly decorated villa with a living room including a flat-screen TV, a fully-equipped kitchen, a bedroom and a bathroom. The spacious terrace offers view of the sunset and the Aegean Sea. 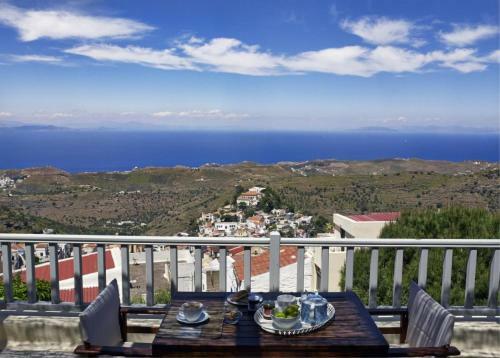 In the beautiful island of Kea, the Kea Village complex overlooks the island’s historic capital, gazing at the Aegean. It is situated just one hour from Athens, and the island’s most scenic beaches are just 15 minutes away. In this magical environment, the staff of Kea Village will be there to offer you hospitality and high standard services to make your stay, a stay to remember. We have created the Kea Village complex in harmony with the island’s natural environment and traditional architecture, as well as offering all contemporary facilities. Traditional Cycladic architecture is combined with contemporary facilities offering to our guests all the comforts so as they feel like being home. Our establishment features two outdoor swimming pools with stunning views to the Aegean blue waters, Ioulida village and the magnificent sunset. Note: Kea Village is an integral part of the traditional settlement at the top of the historic Ioulida and is served by the provincial road network and the steps, which are an extension of the paths of the settlement. In order to make your stay more comfortable, please inform us if you are accompanying people in need of special care. Ioulida is the capital of the island, amphitheatrically structured at the slopes of two hills and fabulously overlooking the Aegean. This is a protected settlement, having been built over the ruins of the ancient city of Ioulis – one of the four cities on the island that knew prosperity and thrived over time, along with Karthaia, Korissia and Piiessa. The Cycladic architecture is blended with the abundant sunlight and the picturesque cobbled streets, offering the perfect scenery for leisurely strolls. One of the major attractions on the island is the imposing archaic statue of the Lion of Kea, situated on the northeastern part of Ioulida. The lion stands tall and overlooks the Aegean, protecting the city. At the Archaeological Museum of the island, you can have a look at the intriguing exhibits from the excavations around Kea. A visit to Karthaia is another amazing experience, on the southeastern part of the island. Admire the fortifications of the city that remain to this day, as you gaze at the Aegean and the bright sky. Life in Chora is tranquil and indolent, away from the hustle and bustle. House Rules Kea Village takes special requests – add in the next step! Kea Village accepts these cards and reserves the right to temporarily hold an amount prior to arrival. Some issues with accidental double charges on my credit card have been sorted slowly but efficient. Breakfast is good but not yet up to the quality comparable hotels will be offering in Greece, extra charges for espresso also not country standard. Very nice location, probably best in Ioulida. Excellent service attitude of staff and very nice rooms with majestic views. You like to just take a glas of wine sit out on the balcony and enjoy this panoramic wonder of teh island. We will be returning again. Beautiful location looking down to the Chora. Stylish and wonderful linen and beds, slept so well! Lovely staff and and the breakfast and food in the restaurant is superb! The coffee at breakfast and the stairs :( of course the view made it all up! Bathroom is really poor for this kind of facility. Somebody would expect more from this quality boutique hotel. IKEA curtains are not fitting to the ''air'' of this facility but the most unpleasant was that allthough the facility is promoting rooms with view and private terraces in fact the room was practically hidden (curtains must be closed all day for privacy because people are passing outside all the day) and the terrace was not at all private. Stuff of this facility was really helpful and polite. It was a pleasure to find young people very gentle and always available to assist in every demand. Location of the public spaces of the facility is ideal. The rooms in the apartment were very well designed and beds were large, albeit the mattresses were rather hard. Breakfast was delivered to our terrace, which was fantastic, but it was a little cold. Great location, view, and design of the room, exceptional service, just steps from the capital of the island, Ioulida. A great place to stay for couples and families. Very clean and very friendly and helpful staff.